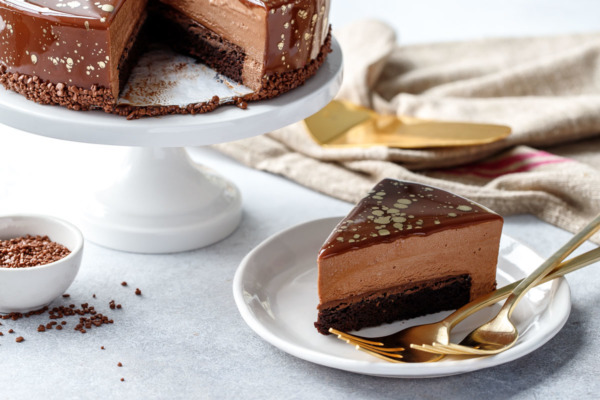 Pillowy milk chocolate and Nutella mousse surrounds a rich cocoa brownie slathered with creamy Nutella. If that’s not impressive enough, the whole thing is enrobed in a gorgeous milk chocolate mirror glaze and decorated with an edible gold splatter. This stunner of a cake is sure to impress your friends and family this holiday season, and with some well-planned time management, is really much easier than you might think. As it turns out, you can easily make milk chocolate or dark chocolate mirror glaze simply by swapping out the white chocolate. Everything else about the recipe is identical, as is the process. While I normally say, when it comes to chocolate, go dark or go home, in this case milk chocolate is the star (and I wouldn’t have it any other way). 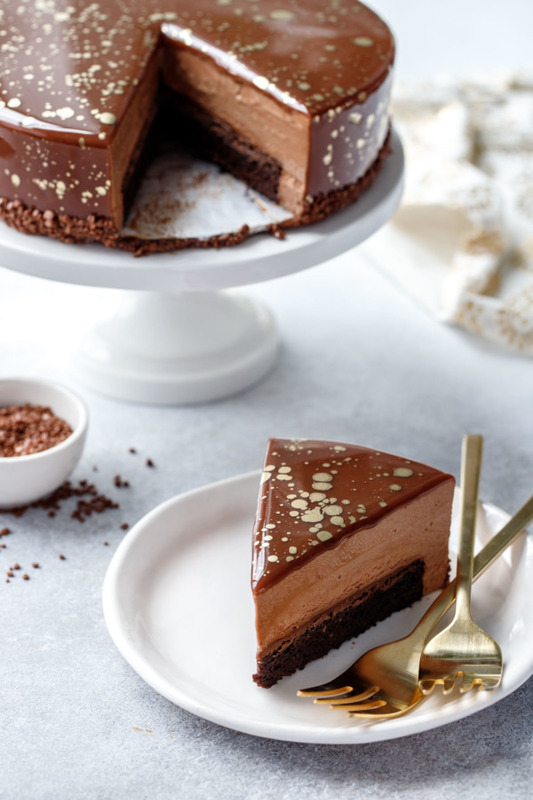 Paired with Nutella, it makes for a uniquely sweet dessert with layers of contrasting textures and complimentary flavors. Just look at those luscious layers, each one good on its own, but great in combination. 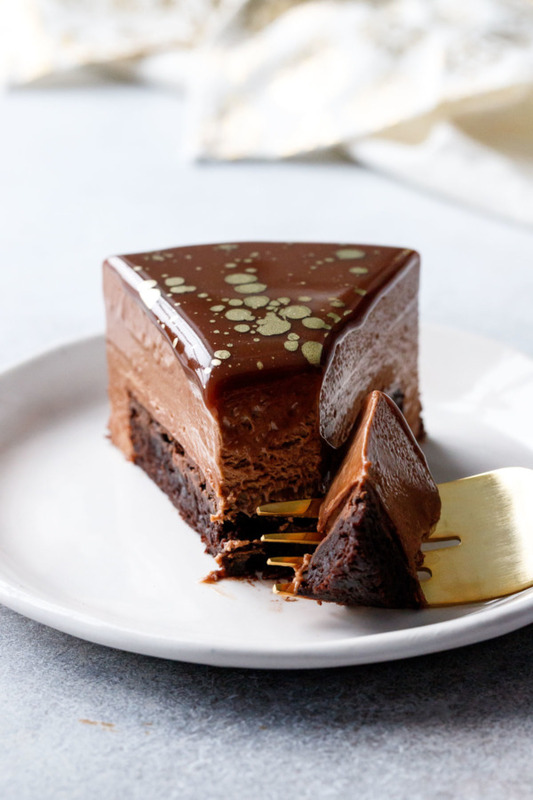 A rich cocoa brownie slathered with a layer of creamy Nutella. A light and airy milk chocolate Nutella mousse. If there were such thing as a Nutella cloud, this is what it’d taste like. And finally, a stunning milk chocolate mirror glaze to finish it off, complete with gold splatter detail and milk chocolate flakes around the edges. Like most of my creations, this one wasn’t perfect the first time around. My first attempt featured an ultra fudgy brownie (I’m #teamfudgelike, no question about it). Of course, the one time I’m not actively trying to get a shiny crust, my brownie comes out of the oven sporting the most beautiful paper thin crackly crust. It was so pretty it almost deserves its own post (and maybe I’ll give it one soon). Figures, I only get a shiny crust when I’m going to be covering it up with Nutella anyway. Ah well. Anyway, I tried to assemble the cake upside down, so the perfectly smooth bottom of the silicone pan would end up being the top of the cake. But as I set the dense brownie round on top of the still-liquid mousse, it slowly started to sink until it was enveloped entirely by the mousse. I pretty much assumed it’d keep sinking and I’d end up with brownie sticking out of what should be the top of the cake. But when I finally cut into it, I discovered the brownie had somehow migrated to the exact center, with a perfect layer of mousse on both the top and the bottom. It actually looked pretty darn cool, even if it wasn’t intentional. Unfortunately, as pretty as it was, the placement just wasn’t practical. The dense brownie required quite a bit more pressure to cut through than the fluffy mousse, squishing the lower bottom of mousse out the sides in the process. The second time around, I went for a lighter, less dense brownie (perhaps the only time you’ll find me intentionally making a cake-like brownie, but it really made the most sense here) and also changed the assembly process so the brownie would end up on the bottom of the cake. 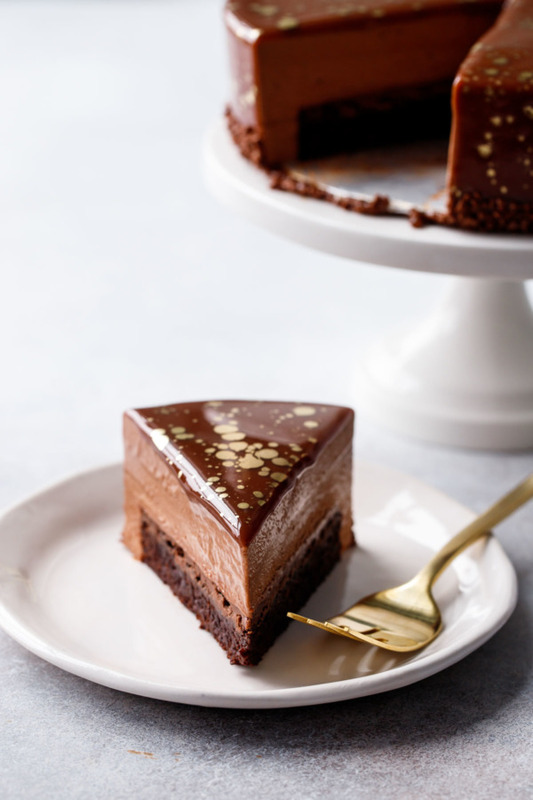 This way, even though the brownie is still much denser than the the mousse, you can actually cut a slice out of it without making a big ol’ mess. The one caveat to assembling it this way is that you can’t take advantage of the perfectly smooth top created by the silicone cake pan. 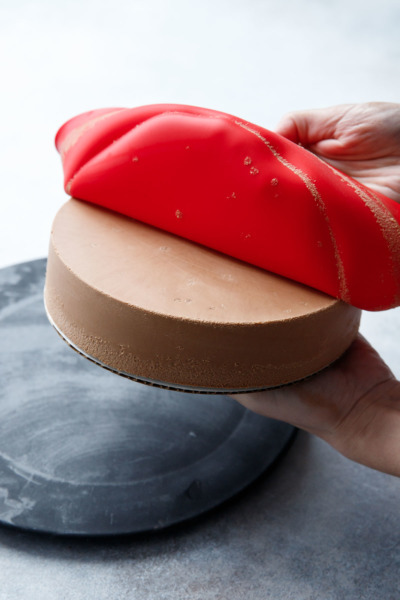 Instead, the exposed top of the mousse is the actual top of the final cake, so you want your mousse to be as smooth as possible. Luckily the mirror glaze is pretty forgiving, so things like small divots or bubbles will get covered up, but if your edges are rough or your top isn’t perfectly level, that could cause problems for you later. I used a warm offset spatula to smooth things out a bit before glazing. The first step is to make your brownie, then cut it into a circle about 1-inch smaller than your final cake. This will allow the mousse to fill in the spaces around the edge and make for perfectly smooth sides. Oh, I also spread a layer of Nutella onto my brownie, because why not? Pop the Nutella-covered brownie into the freezer for a bit while you prepare the mousse. 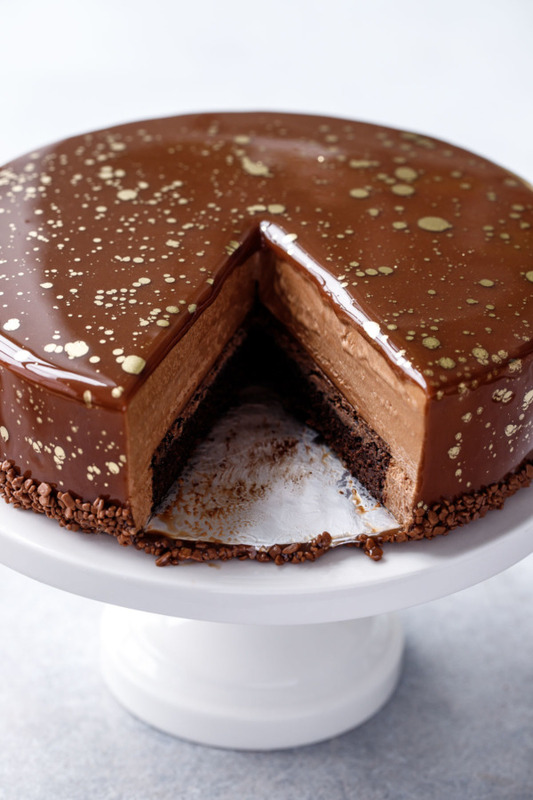 The mousse is simply whipped cream folded into a milk chocolate and Nutella ganache. I reinforced the mousse with a little bit of gelatin to help it hold up more sturdily against the glaze. 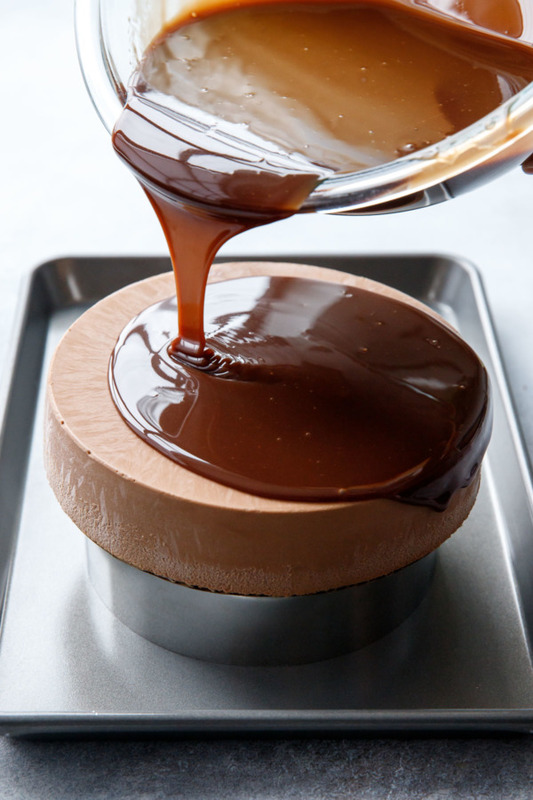 A silicone cake pan is really the best way to make smooth-sided mousse cakes. Once frozen, you can peel away the silicone leaving a perfectly smooth cylinder ready for glazing. You could also use a springform pan or a deep pastry ring lined with a strip of acetate like I did here. Your cake won’t be quite as smooth around the edges once you peel off the acetate, so I recommend running a warm offset spatula around the edges to smooth things out a bit more. Set your cake on a cake round or a piece of cardboard just barely smaller than the diameter of your cake (if it is larger, the glaze won’t flow off cleanly). Elevate the cake off the cookie sheet (and the purpose of the cookie sheet is to catch the excess glaze that flows off. This can be scraped off and reused!) I used the same 6-inch pastry ring that I used to cut out my brownie, but something like a large ramekin or heavy soup bowl would work too, just as long as it’s smaller than the diameter of your cake and plenty sturdy to keep the cake firmly in place. 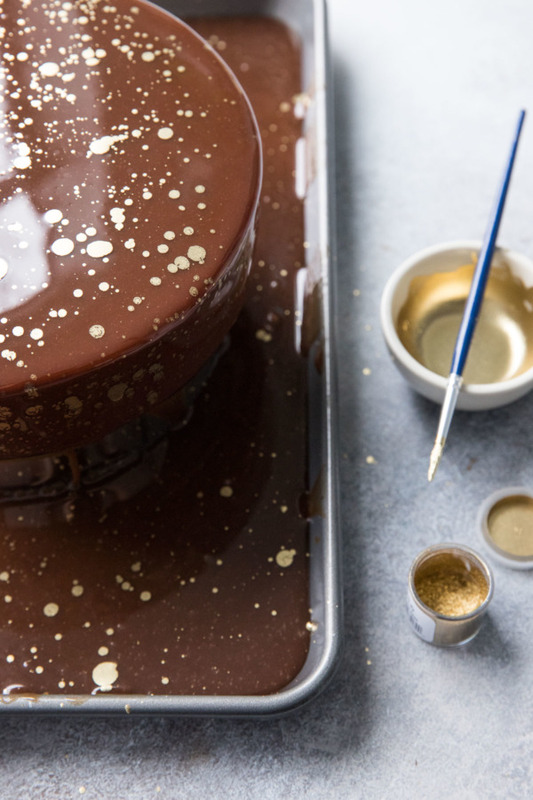 When it comes to a mirror glaze, temperature is key. The glaze is perfectly pourable around 94 degrees. Warmer than that and it’d flow off the cake too thinly, cooler and it might not flow off at all. Use an accurate instant read thermometer and stir the glaze until it reaches the ideal temperature before pouring it over your cake (if the glaze gets too cool, microwave it in short bursts at 50% power to bring it back up to temperature). I wanted to keep the decoration simple to emphasize the striking mirror glaze, but just the glaze on its own still seemed a bit boring to me. I had a little pot of gold luster dust, which I turned into edible gold paint by mixing it with a little vodka (you don’t need much, like 1/4 teaspoon max for the whole cake). Then I channeled Jackson Pollock as best I could and splattered gold all over the cake (and my face and the floor and probably the cat too). I was super pleased with the final result! Tip: Rather than violently slinging your brush towards the delicate cake, instead hold the brush a 4-5 inches off the surface of the cake and gently tap the paintbrush (an inch or two below the brush head works best) with a wooden spoon to direct the splatters (mostly) towards the cake. You’ll definitely still make a mess of things, but hopefully the majority of the splatters will end up on the cake. 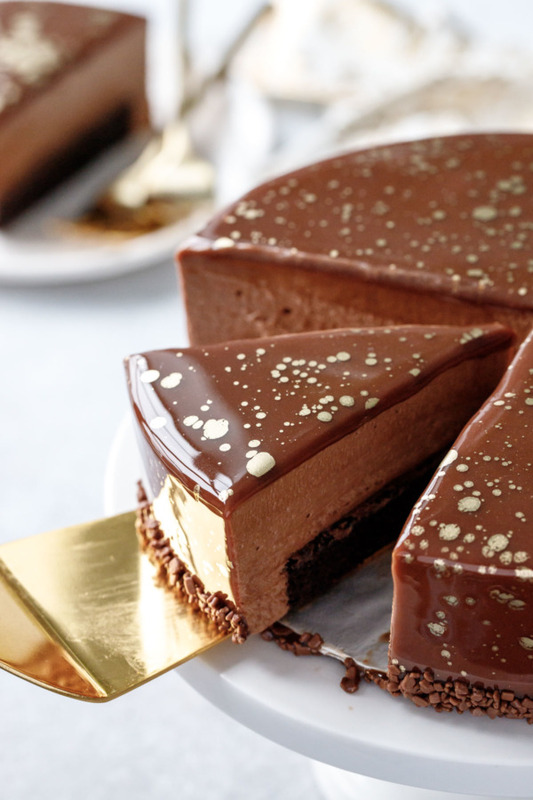 This ridiculously impressive, but surprisingly doable dessert is more than manageable if you split the work into 3 or even 4 days (you need at least 2 days since the mousse needs an overnight freeze before glazing, but can certainly start up to 5 days ahead of time if you really want to get a jump on things). By dividing the work into easily manageable chunks of time, less than an hour of active time each day, and you’ll be surprised at how easily this cake comes together. Day 1: Make the glaze. The longest part of the whole process is waiting for the glaze to cool to the ideal temperature. You can make the glaze up to 5 days ahead of time and store in an airtight container or zip-top bag in the fridge until you’re ready to use it. For storage longer than 5 days, the glaze can be frozen in an airtight bag with all the air removed (or use a vacuum sealer if you have one). Day 2: Make the brownie. Let cool completely (or even overnight). Cut into a round and spread with Nutella, then freeze for at least 30 minutes before assembling. Day 3: Make the mousse and assemble the cake. Freeze overnight. Day 4: Rewarm your mirror glaze and pour over the frozen cake. The finished cake will keep just fine overnight in the fridge too (the mirror glaze seals everything quite nicely and keeps it from drying out). This stunner of a confection would be the perfect centerpiece to your Christmas or New Year’s party! 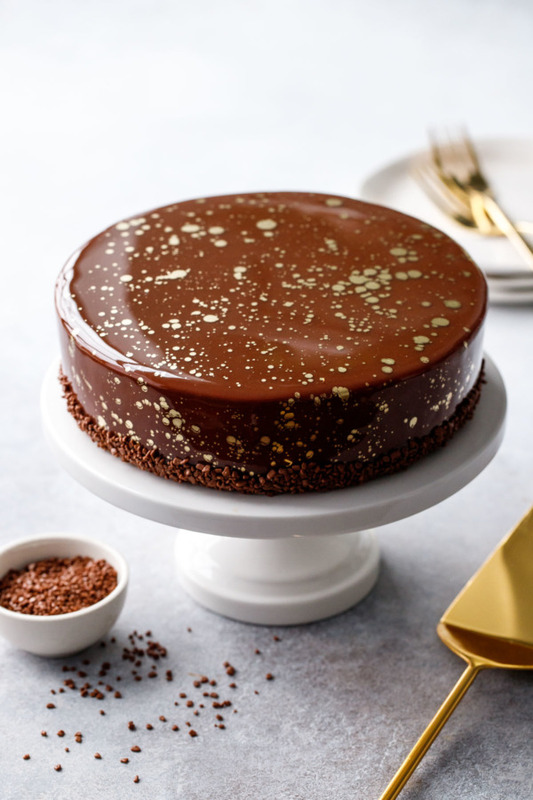 It’s already dressed to the nines with its mirror-like glaze and metallic gold splatters, all it needs is a reason to celebrate. I mean, really, have you ever seen a prettier cake? 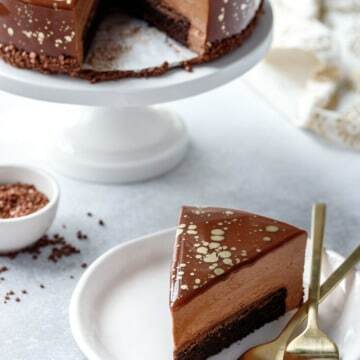 Pillowly milk chocolate and nutella mousse surrounds a rich chocolate brownie and a layer of creamy nutella. If that’s not impressive enough, the whole thing is enrobed in a gorgeous milk chocolate mirror glaze. Preheat oven to 350 degrees F. Line an 8-by-8-inch baking pan with lightly buttered parchment paper. Melt butter and vegetable oil in a small saucepan or in the microwave on medium heat. Pour into mixing bowl with sugar and stir until paste-like. Add eggs, one at a time, whisking until completely incorporated before adding the next. Mix in vanilla. Whisk together flour, cocoa powder, baking powder and salt. Add to bowl with butter mixture and stir until almost fully incorporated and just a few streaks of dry ingredients remain. Add milk and stir until smooth. Pour into prepared baking pan. Bake for 25 to 30 minutes or until a toothpick inserted near the center comes out mostly clean with a few moist crumbs attached. Place pan on a wire rack and let cool completely. When brownie is cool, lift out of pan using parchment paper as handles. Cut into a 6-inch circle (about 1-inch smaller than the size of your final cake). Spread a thin layer of Nutella on top, then place in freezer for at least 30 minutes or overnight. Cut gelatin sheets into 1-inch strips and submerge in cool water for at least 5 minutes to soften. If using powdered gelatin, sprinkle 2 teaspoons over 2 tablespoons of cool water to soften. 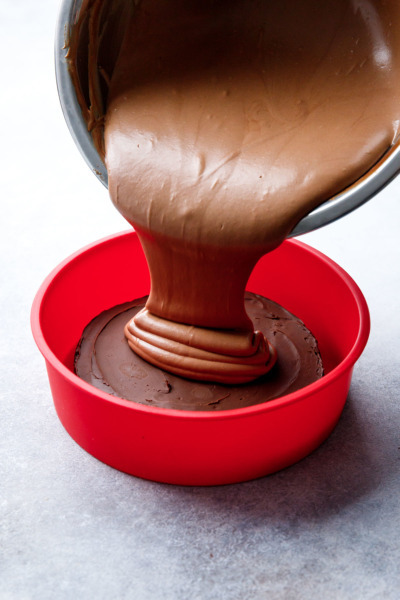 Melt chocolate and nutella in a double boiler or in the microwave on short 30 second intervals at 50% power. Heat 1/2 cup cream in a small saucepan over medium heat until it just begins to bubble around the edges. Remove from heat and add gelatin (if using leaf gelatin, squeeze out as much water as possible first) and whisk until completely melted. Pour over chocolate and Nutella. Gently whisk, starting in the center and working in small concentric circles, until a smooth and shiny emulsion forms, then gradually whisk in larger circles until all the cream is completely incorporated and mixture is smooth. Stir in a pinch of sea salt. In a clean bowl or the bowl of a stand mixer, beat remaining 1 cup cream until it holds soft peaks. Add 1/3 of cream to the chocolate mixture and fold to lighten, then add the entire chocolate mixture to the bowl with the cream and fold until fully incorporated. 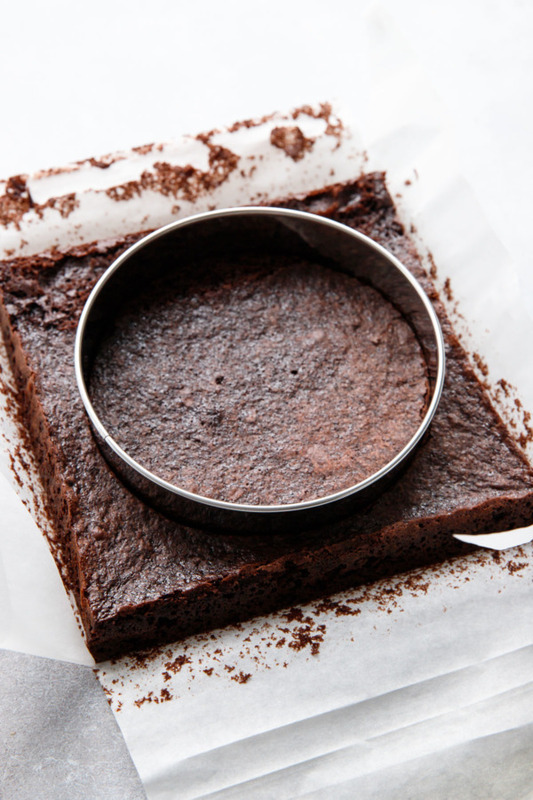 To assemble, place your frozen brownie round into the bottom of an 8-by-2-inch deep silicone cake pan, Nutella side up. Pour mousse over top of brownie. Place silicone cake pan on a hard, flat surface, and firmly tap it a few times against the counter to remove any air bubbles and even out the top surface. 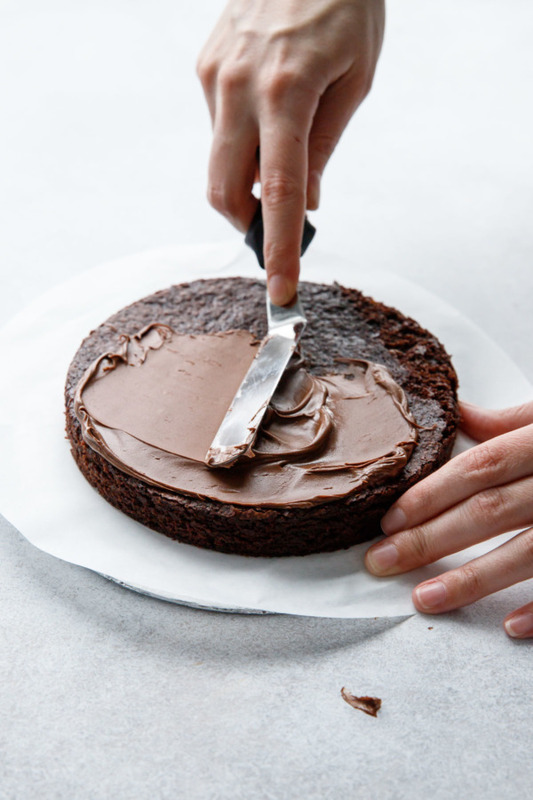 If necessary, use an offset spatula to spread the mousse into as smooth and even a surface as possible. Place entire cake into freezer and let freeze until completely firm, at least 6 hours or overnight if possible. Remove from silicone pan. Smooth out any rough spots with an offset spatula if necessary. Place, brownie side down, on a cake board or other solid surface and put back in the freezer until ready to glaze. (Mirror glaze can be made up to 5 days ahead of time; store in an airtight container in the refrigerator and rewarm to ideal temperature before using. This recipe makes enough glaze for two 8-inch cakes). Cut gelatin into 1-inch strips and submerge in cool water for at least 5 minutes to soften. Place milk chocolate in a heat-proof bowl and set aside. Remove from heat, then add gelatin (squeeze out as much water as possible first) and whisk until dissolved. Whisk in sweetened condensed milk. Pour hot mixture over chopped chocolate and let sit for 30 seconds, then stir until chocolate is completely melted and mixture is smooth (you can also use an immersion blender if you have one to expedite this process, just try not to mix air bubbles into the glaze if possible). When the glaze reaches about 94 degrees, remove your cake from freezer and place on a cookie sheet, elevated off the sheet using something slightly smaller in diameter than the cake itself so the glaze can drip off (I used the same 6-inch cake ring I used to cut out my brownie). You can always rewarm the glaze if it gets too cool (do so gently over a double boiler or in very short intervals in the microwave). Pour glaze generously over cake, taking care to ensure there are no bare spots left. Allow the excess glaze to drip off for 5 or 10 minutes, then gently scrape the edges to remove any remaining drops or built up glaze. 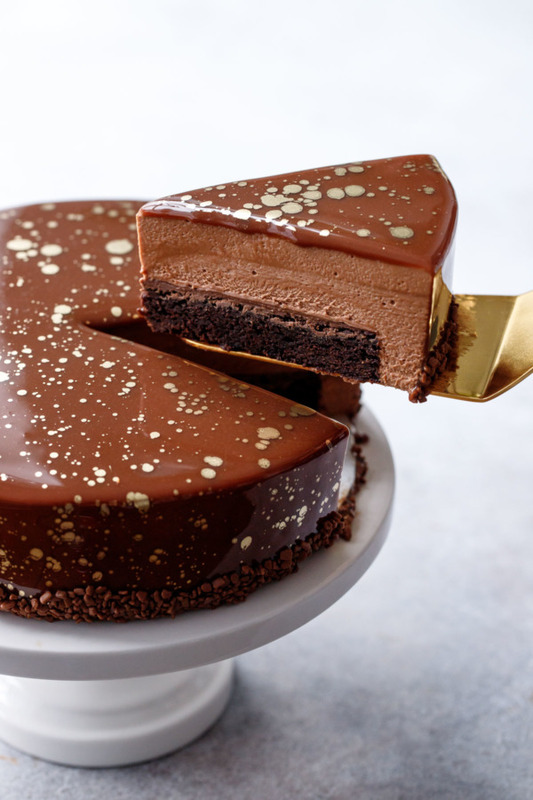 If desired, splatter with edible gold luster and press some chocolate sprinkles around the bottom edge. Carefully transfer cake to cake stand or serving plate and refrigerate until ready to serve. Let sit at room temperature for 15 minutes before serving. For perfect slices, dip a large knife into hot water to warm it before slicing, and wipe off the blade completely between each cut. Glazed cake will keep uncovered in the refrigerator for up to 5 days. * To substitute powdered gelatin, use 1 teaspoon of powdered gelatin per 1 sheet of leaf gelatin. Instead of softening the gelatin in cold water and then wringing it out, sprinkle the gelatin over a few tablespoons of cool water to allow it to soften, then add the whole mixture to the hot liquid to dissolve.